Russell Harcourt is steadily gaining recognition on the operatic stage and concert platform throughout the UK and Australasia for a refined brilliance of vocal colour and the comic charm of his characterisations. 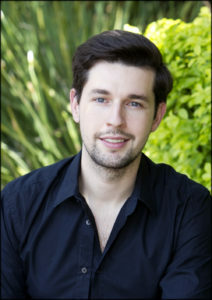 Russell studied voice with Graham Pushee and made his operatic début in 2007 as Oberon A Midsummer Night’s Dream with the Western Australian Academy of Performing Arts. He made his Australian concert début in 2009 as a guest artist at the Australian Festival of Chamber Music and made his Royal Opera House début in the Crush Room in the Deloitte Ignite 2010 series. Career highlights include his critically acclaimed performances of Nerone Agrippina at Brisbane Baroque which earned him an OperaChaser Awards Special Commendation and a Helpmann Award Nomination, Rosenkrantz (cover) in Brett Dean’s HAMLET for the Glyndebourne Festival, Athamas SEMELE under the late Sir Charles Mackerras, the title role in Handel’s ORESTE for the Royal Opera, Armindo Partenope Opera Australia under Christian Curnyn, working with the acclaimed director Peter Sellars in John Adams’ Gospel According to the Other Mary for Theater Bonn and Andronico in Vivaldi’s pasticcio BAJAZET and Corrado GRISELDA, both with Sydney’s Pinchgut Opera. Other engagements include Volano IL GIASONE under Jane Glover (RAM); Fox/Coachman (cover) The Adventures of Pinocchio Opera North; Zelim (cover) La verità in cimento, Licida (cover) L’Olimpiade both for Garsington Opera, Hunahpù (cover) The Indian Queen for Peter Sellars at ENO and David (cover) SAUL for Glyndebourne on Tour. Oratorio experience includes alto soloist in Handel Messiah, Judas Maccabaeus, Israel in Egypt, J. S. Bach St. Matthew Passion, Mass in B Minor, Weihnacht’s Oratorium, Schnittke Faust Cantata, Bernstein Chichester Psalms, Pergolesi Stabat Mater and Vivaldi Stabat Mater, Magnificat and Gloria. Russell holds a Bachelor of Music from the Sydney Conservatorium of Music and an MA, Dip. RAM in Opera from The Royal Academy of Music. He studied part-time at the National Opera Studio and is an Associate former young artist of the Jette Parker Young Artist’s Programme at the Royal Opera House Covent Garden. He has performed in master classes for Emma Kirkby, Michael Chance, Andreas Scholl and Rosalind Plowright and he is an alumnus of the Britten-Pears Young Artist Programme. Russell currently lives in London and studies with Yvonne Kenny.